Over the weekend the MoMA opened its glass doors for the Picasso: Guitars 1912 - 1914 exhibition. A private viewing last Friday night allowed The NewsGallery a first look at the extensive collection of Pablo Picasso's infamous guitar phase--a collection of over 7o pieces of work, some of which, have yet to be unveiled to the public up until now. It was during this particular prolific moment in Pablo Picasso's early thirties, when he developed and thereby evolved the cubism method to its second stage, along side fellow cubist Georges Braque. Composing together only a few items into the literal picture, the result afforded within these two years of experimentation, would later define Picasso as one of the most talented and daring artists who ever lived--eventually pushing behind the impressionist movement that had been dominating the French art scene for so long. 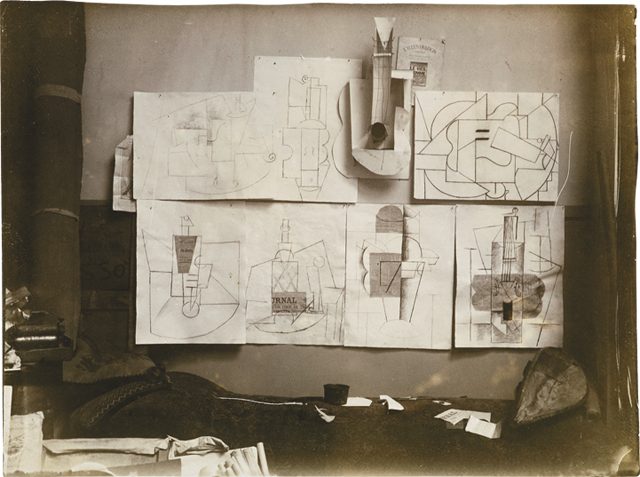 He innovated his way into what later became the cemented radical stamp of cubism--transforming the technique from Analytical Cubism seamlessly into Stage II: Synthetic Cubism. assembled before November 15, 1913. The collection consists of different types of art forms: from initial drawings, mixed material collages (above), to two exquisitely done sculptures of a guitar--one of them, impressively made out of card board (pictured right) was apparently hiding in Picasso's basement for quite some time; the other, is a breathtaking guitar made out of metal, colored in a rustic flawless dark brown; and of course, there are also a variation of Picasso's paintings (see below). 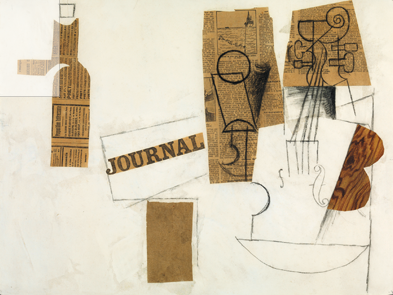 During these series of experiments with Braque, Picasso decided to consciously shift away from Analytical Cubism (1909 -1912, an aesthetic more inclined to feature monochromatic tones in two dimensional configurations); he was looking to simplify the already decoded analysis of the whole, by combining fewer subjects (guitars, bottles, glasses, and violins). He also concentrated the number of materials that he would later use to create with, enable to reconstruct different variations of the deconstructed. Picasso used cut out wall paper, colored paper, newspaper, sheet music, table cloths, paint with grit, among a few others to outline the atmosphere while reiterating a multitude of unexpected combinations--vacillating from two to three dimensional perspectives. But perhaps what breaths the most refreshing air into these collections (of over 30 private and public worldwide), is the fact that Pablo Picasso was able to exercise and elevate his inventive mind without allowing his work to be completely entrenched by one of his multiple and often simultaneous torrid love affairs. The artist was not only widely well known for his incomparable brilliance, but also for badly mistreating all the women in his life (two of which committed suicide). More often than not, he tried to exorcise the turmoil away from his own consciousness and into the canvas. Absent are the misogynist figures that gave us the key into the torrential personal life of the artistic genius. Violin Hanging on the Wall. Possibly begun Sorgues, summer 1912, completed Paris, early 1913 (left). Guitar, Gas Jet, and Bottle. Paris, early 1913. Oil, charcoal, tinted varnish, and grit on canvas (right). In short, conceivably the Synthetic Cubism period for Pablo Picasso epitomizes the subtext of his emotionally sober period; thereby, leaving the artist with intellectual and artistic freedom to create and moreover, reinvent the conventional methodically--in ways that hadn't been seen before. It was during these years that Picasso was with his second girlfriend Eva Goul--perhaps the only woman he didn't have a tumultuous relationship with. Unfortunately, Goul prematurely died of cancer at the age of 30. 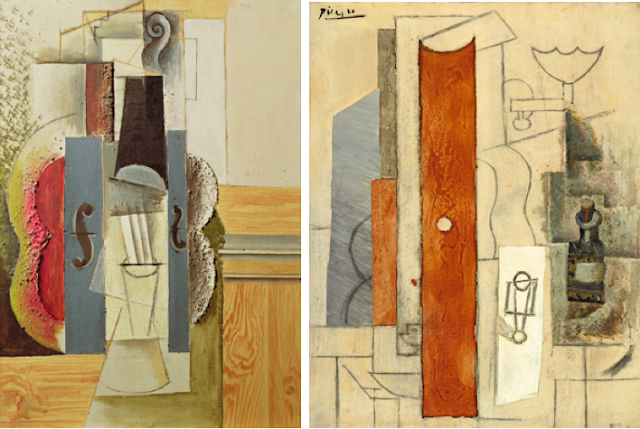 Shortly thereafter, Picasso fell under the spell of Classicism and Surrealism. 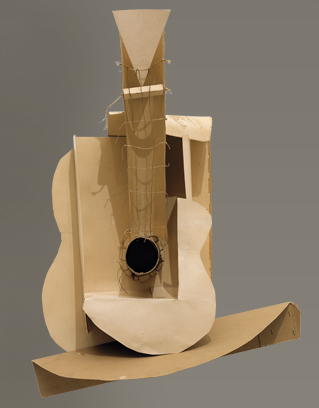 So if you're in New York, we highly recommend checking out Picasso: Guitars at the MoMA. The guitar show will be showing through June 6, 2011: It's inspiring, enlightening and inventive in a timeless fashion--a typical equation of genius. For a more extensive look at Pablo Picasso's method during the Synthetic Cubism of Guitars, have a watch at the video (above via La Biennale TV) by curator Anne Umland. And to get tickets go, HERE.